Individual Rambol Cheese; great for hampers and picnics. Soft Cheese with chopped walnuts throughout. Also available as a cut to order Cheese below. Supply is intermittent; suggest selecting Substitution allowed option at Checkout and if unavailable in this format, we will send equivalent value of this Rambol as a cut piece. Excellent online service and very tasty cheese delivered to specification.I have ordered from this shop at Xmas time for the past 4 years and their service and goods (not only cheese ) is outstanding. Thank you. this is a super cheese, sad that it cant be purchased locally !!! service from you is first class, only thing that spoils the purchase is the delivery charge really expensive !!! This is my mother''s absolute favourite and we can''t find it anywhere else. Great cheese and well package although postage costs are a bit steep for a small order (3 packs). I understand the reason given the temperature controlled environment but it doubles the price of the order. I had been looking for this cheese for years since my local Sainsbury had stopped selling it. Delicious with french bread and salad, and arrived in perfect condition. Excellent. This Rambol cheese with walnuts was excellent and arrived in pristine condition on the prearranged day. I knew this cheese was good because I had had it before but was unable to source it locally so I reverted to the internet. 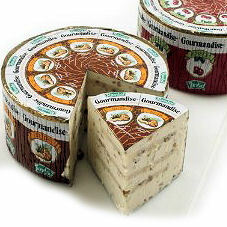 I used to buy this cheese in almost every shop but for a long time have been unable to find it. Imagine my joy at finding a supplier. I had forgotten how much I like this cheese but am now able to buy it again. Wonderful!